Balancing work and the everyday mundane routine can take its toll on anyone. For many, we work to live instead of live to work. Escaping the noise – whooshing traffic, tiring phone calls, the endless email inbox, and the cries of city sirens is something we all desire to escape. Where can you go to turn the world off, gain perspective from the vast universe, and add a sparkle of magic to your life? Under the stars in Moab, Utah. Red sand cliffs with miles of running and hiking trails nestled between the Colorado River, Arches National Park, and a charming small town invite you to take a breath of fresh air outdoors, yet there is something about the starry night sky that fills your sense of wonder. Recharge your body under the vibrant stars at Under Canvas Moab, a glamping site with a view of Arches in the distance. The soothing breeze of fresh air as you turn off the digital world and listen to the sounds of nature, calms your nerves as you sink into relaxation. For me, star-gazing allows me to recenter myself – realizing the world and galaxy is so vast, with so much unknown, and even more to be explored. Conversation under the stars is like a great night of back porch sitting, where all the good feels are felt. Check your ego at the highway, because here you are one with nature and yourself, and it is all about letting go and reconnecting to your inner senses. The camp site is naturally perfect. 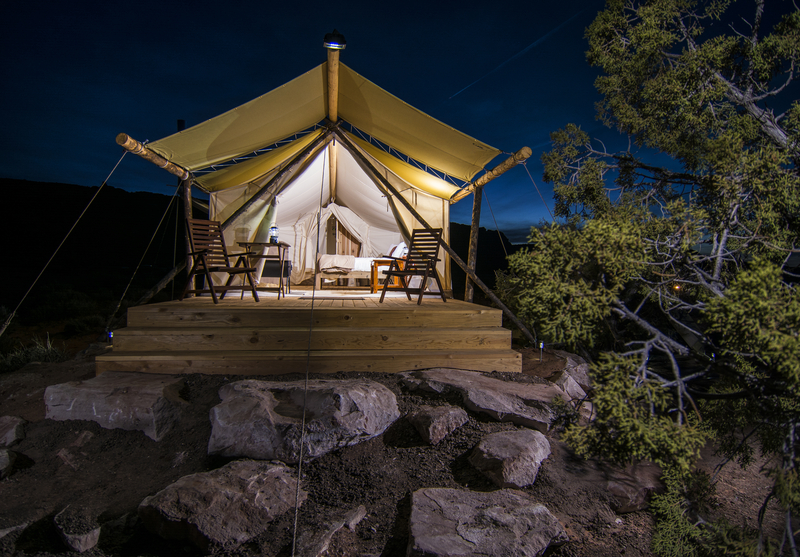 Pitched white tents with private decks, wood burning stoves, comfy beds, provide an all-access pass to long-range views of red rock and an intimate connection to the outdoors. Without a restaurant on-site, it provides the opportunity to enjoy the vibrant, small town yet escape the everyday. I went down solo, to get a personal recharge, and in hopes to write my upcoming wedding vows. I wanted to explore a bit, and so I took a drive, finding myself in on the scenic byway, UT-128 headed towards Castle Creek Winery. The scenery was enough to lift my spirits and remind me of the stomach butterflies produced by the excitement of living life to the fullest. Stopping for a sip of wine before my dinner reservation, I was pleasantly surprised at the venue, the wine, and the craftsmanship of local artisan gifts. Gawking at the stars is something magical, and why I chose to dine on a patio next to the Colorado River. With Bluegrass playing in the background and the reassurance of Mother Nature, I enjoyed personal reflection time while dining at off-the-beaten path Sorrel River Ranch. it was the perfect accompaniment to my wonder-filled starlit moments in Moab. For day-time magic, ask Mac Lloyde from Hike Moab to take you exploring on a local secrets hiking tour. If you want to explore on your own, visit Arches and find yourself staring through The Windows Arch. The Moab stars know the meaning of a soul-filled connection to nature and nurture. Next time you need an escape to recharge to feel the emotion of a life worth living, find yourself under the stars of this red rock heaven.